All jewelry has an intrinsic value which makes it a popular item for collectors. Jewelry is small, easy to display, and ready to wear. 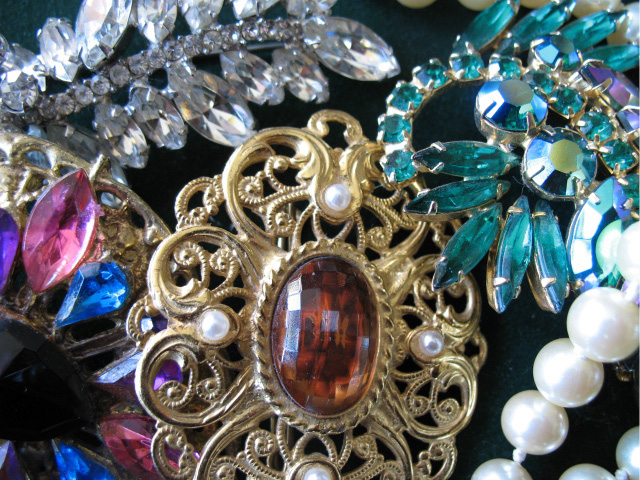 Collecting antique and vintage jewelry can be like a treasure hunt! I’m going to cover two categories of jewelry (fine jewelry and costume jewelry), and popular style (cameos). Fine jewelry and costume jewelry are both popular with collectors. Signed pieces usually indicate better jewelry, but not necessarily, as quality examples are available without a maker's mark. Antique jewelry are pieces made prior to 1960, and jewelry made after 1960 are considered collectibles. Fine jewelry is made of precious metal and gemstones. Look for quality made pieces. Try to collect pieces that are stamped, or have a makers mark. These are referred to as signed pieces. Also look for artistic design, quality, rare and unusual, antique and vintage. Buy pieces that appeal to you. Antique fine jewelry is a customer favorite. The second style or category is costume jewelry. Custom jewelry may be bakelite, plastic, faux pearls, rhinestones, colored stones, and more. Some collectors look for just cameos, black mourning jewelry, only clip style earrings, or ostentatious brooches. There are many possibilities! Finding a signed piece is a bonus—though never a necessity. Always buy what you like. We have a large variety of antique and collectible costume jewelry. Stop in to browse what’s available. A fascinating and favorite collectible is the cameo. Cameos are found in pins, pendants, rings and bracelets, molded or cut, precious materials or plastic-a cameo is one of the most popular jewelry items my customers look for. The image can be a famous historic scene or character, or the classic female profile. Carved cameos are generally made of shell that gives a two-tone color. Molded cameos are often made of plastic or glass, and several were made in bakelite (or bake-a-lite, a synthetic resin or plastic ) in the 1950s. Often a cameo is handed-down from a grandmother or great-grandmother as a treasured family heirloom. HH Antiques usually has cameo brooches, cameo pendants, and cameo ring offered for sale. Prices typically range from $10.00 - $85.00. Call us for availability 1-419-867-1676 or stop in to browse today.